Recently I discovered a Facebook group with the unusual name Vintage backpacking using modern andvintage gear. 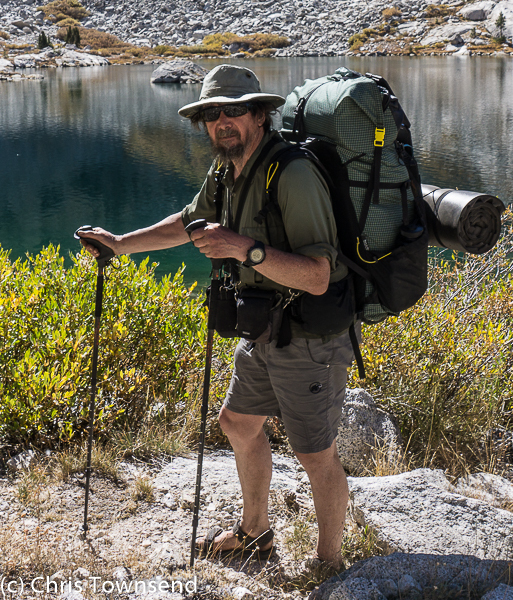 The founder, Friar Rodney Burnap, says he started the group ‘because most of the other backpacking groups didn't want you posting about External frame backpacks’. On the site he’s posted many pictures of external frame packs and other old gear and initiated a number of discussions. 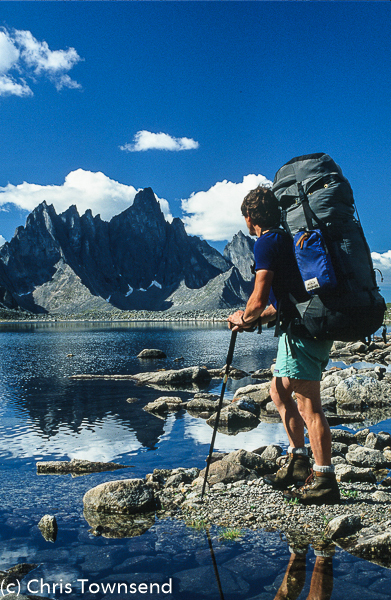 If you’re interested in outdoor gear it’s a fascinating site. I’ve added a few comments and pictures (and discovered that Friar Burnap likes my work and is a big fan of Colin Fletcher, as I am). 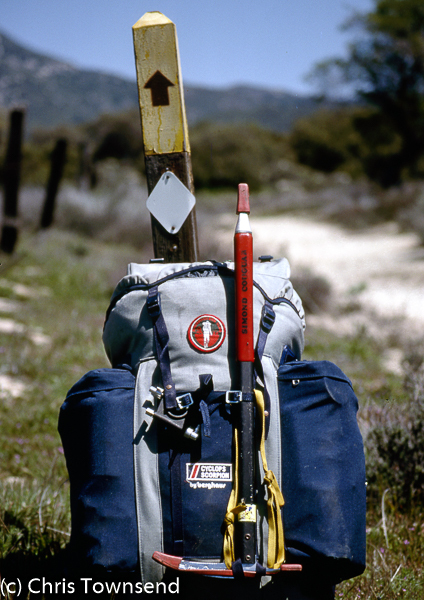 Looking through the posts on that site started me thinking about the packs I’ve used over the years, especially on long-distance walks. 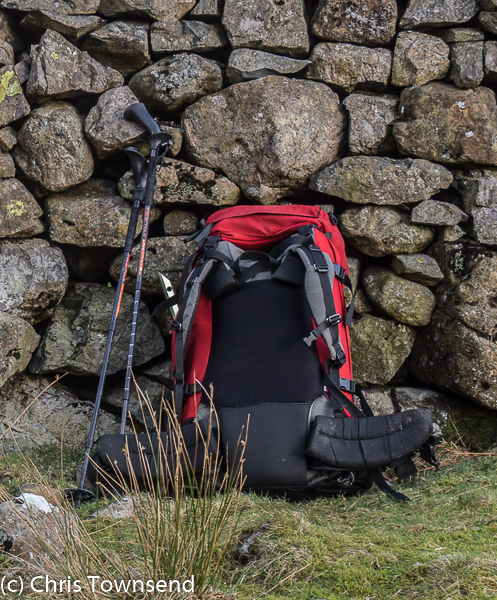 Considering them I realised that the big change has been in capacity and weight – as gear in general has got more compact and lighter so have the packs I use. However despite all the developments in materials and designs the packs I used forty years ago would be fine today. Over the years I’ve gone from external frame to internal frame to, briefly, frameless and back to internal frame. Here’s a run-down of the key packs. 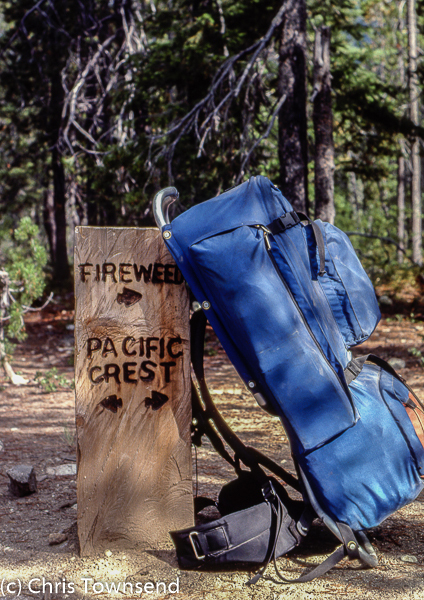 After a couple of poor choices when I started backpacking – a cheap external frame that broke and a better quality one with no hipbelt and a difficult to use packbag – my first good pack was the Camp Trails Ponderosa, which came with an external frame called the Astral Cruiser. I bought this because it was recommended in the first backpacking books I read, Teach Yourself Backpacking by Peter Lumley and The Backpacker’s Handbook by Derrick Booth (much later I pinched the last title for one of my books). The Ponderosa was a classic external frame pack of the time. In 1976 I used it on my first walk longer than a weekend, the Pennine Way, and found it a little unstable on rough terrain though very comfortable on good paths. However the hipbelt ripped off towards the end of the trip and I had to sew it back on. That failure meant I wanted a new pack for my first really long walk two years later, Land’s End to John O’Groats. Berghaus, then still a fairly new company, had recently launched their internal frame Cyclops pack and they looked tough so I picked one of these, the 80 litre Serac. This proved comfortable and survived the walk so for my next long trip, the Pacific Crest Trail in 1982, I went for a bigger Cyclops model, the 100 litre Scorpion, reckoning I’d need the extra capacity. I did and could have done with more. 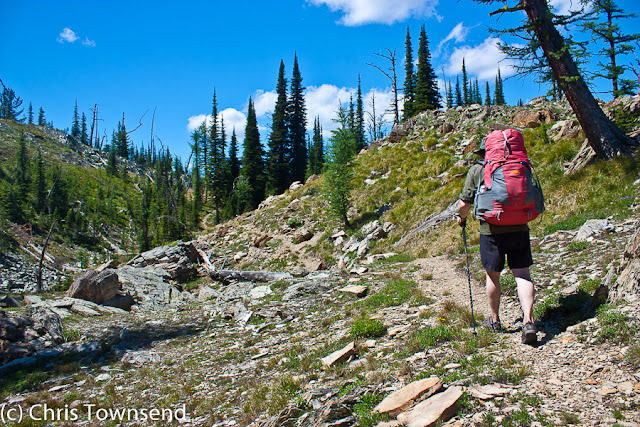 At one point I carried my heaviest every load – 23 days supplies plus ice axe, crampons, snowshoes, and extra clothing. The pack almost disappeared under all the gear on the outside. The Scorpion performed well but after around 1500 miles the frame snapped – probably weakened when I let it bounce down a steep snowy pass in the High Sierra. As the frame was sewn-in to the padded back and was an unusual asymmetric X shape I couldn’t replace it. Unable to find an internal frame pack big enough I replaced it with an external frame one, The North Face Back Magic II. This had an equally unusual frame, an asymmetric hour-glass shape. It handled the last 1000 miles of the PCT fine but developed a slight bend in the frame on the airplane on the way home. I still have it. Maybe I’ll try it again soon. 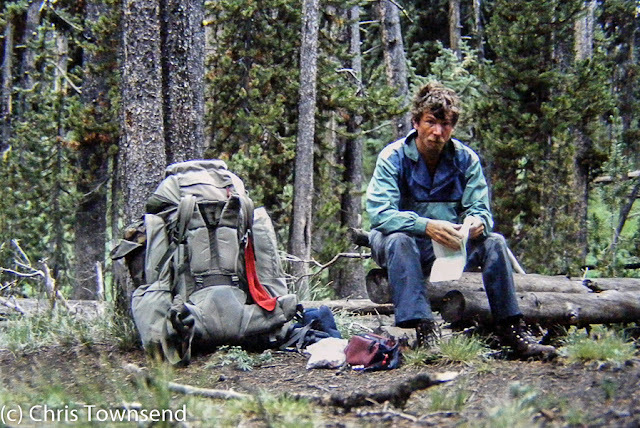 Next came my 1985 Continental Divide Trail walk. After the broken Cyclops frame I looked for a different internal frame one and ended up with the Karrimor Condor 60-100, another huge pack with the biggest side pockets I’ve ever seen. This lasted around 2000 miles and then one of the shoulder straps snapped. It had rubbed against the hard plastic reinforcement in the hipbelt and slowly weakened – if I’d spotted this I could have padded it. After that I checked packs more often. I replaced it with an even bigger 125 litre Gregory Cassin, bought because it was recommended by Colin Fletcher in the latest edition of The Complete Walker. It was very heavy but also the most comfortable pack I’d yet used. 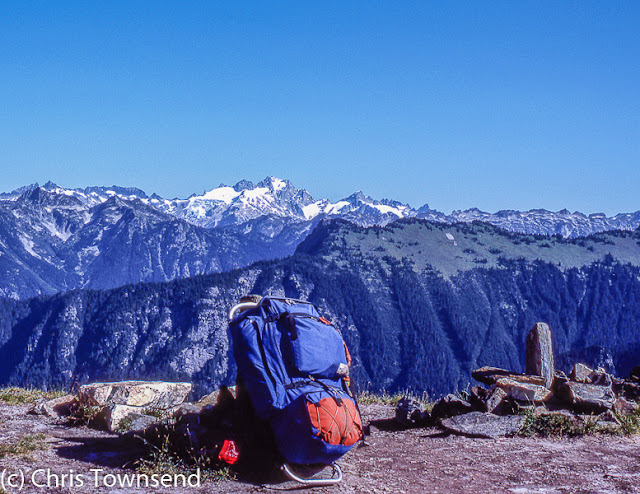 I went back to the Karrimor Condor 60-100 for my 1988 walk the length of the Canadian Rockies but the hipbelt design had changed and I couldn’t get it comfortable – I obviously hadn’t tested it at home adequately. By this time I was reviewing packs for magazines and so had quite a choice of models. Lowe Alpine, who’d invented the internal frame pack, had sent me a prototype for their first external frame model called the Holloflex. This had the most massive padded hipbelt I’d ever seen plus a plastic frame that was said to be extremely tough. With sore hips from the Condor I fancied that hipbelt and had the pack sent out to me. It did prove superbly comfortable but the hipbelt began to part from the frame towards the end of the walk and ended up being held on with duck tape. The Holloflex never went into production due to the costs. It was the last time I used an external frame on a long walk. Two years later I returned to the Gregory Cassin for a walk the length of the Yukon Territory and again it was fine though by the end of that trek it was looking rather worn so I decided it wasn’t up to another long walk. By this time New Zealand company Macpac had arrived in the UK and their packs, made from a canvas like polyester/cotton fabric, looked really tough so I took the 90 litre Cascade on a 1992 walk the length of the Scandinavian mountains. Most of the way it was fine but towards the end of the walk the buckles on the hipbelt and shoulder straps started slipping annoyingly often. 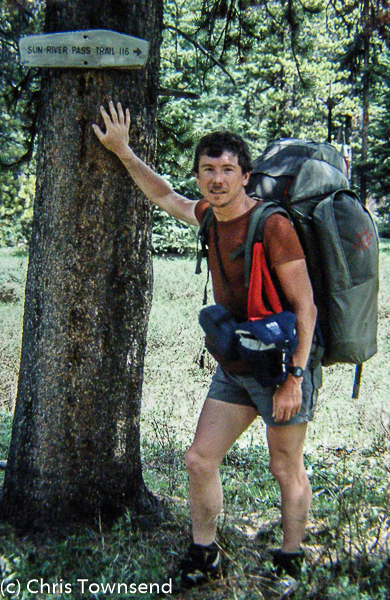 During the 1990s I led many ski tours, including camping expeditions to places like Greenland, Spitsbergen, the Yukon Territory, and the High Sierra. For this I needed a monster pack that was very stable as well as comfortable. A bit of research and I discovered the 115 litre Dana Designs Astralplane. I bought one and it was superb, the most stable huge pack I’ve ever tried. It proved very tough too. Indeed, I still have it and it’s in fine condition. I’ve never used it on a long-distance walk however as it's also the heaviest pack I've ever had. 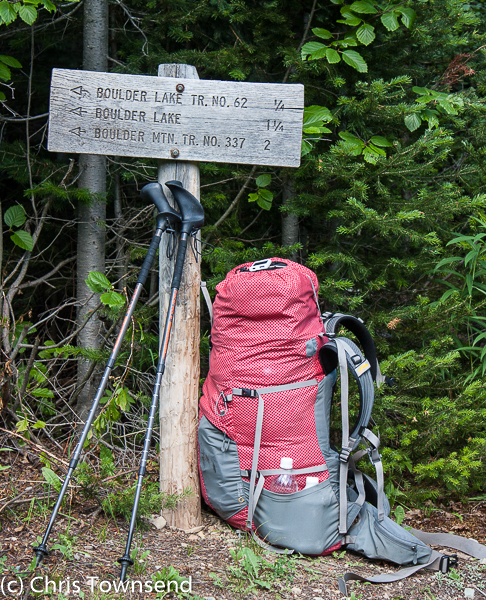 The packs above all weighed in the 2.5 -3.5kg range. That’s heavy. 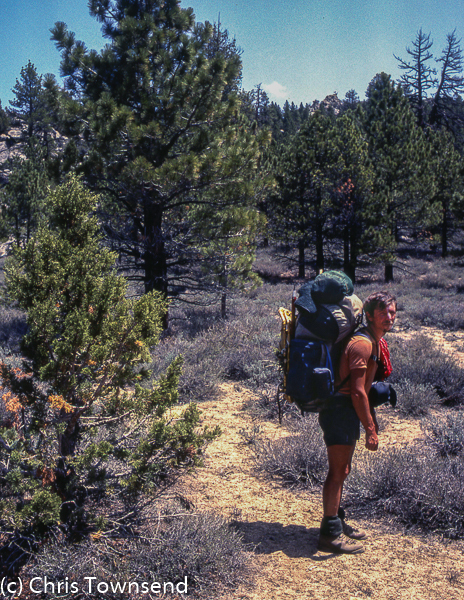 The ultralight gear revolution had begun in the early 90s and there were now frameless packs that weighed less a kilo. I didn’t find them comfortable with more than a light load. For my next walk I did want a lighter pack though. 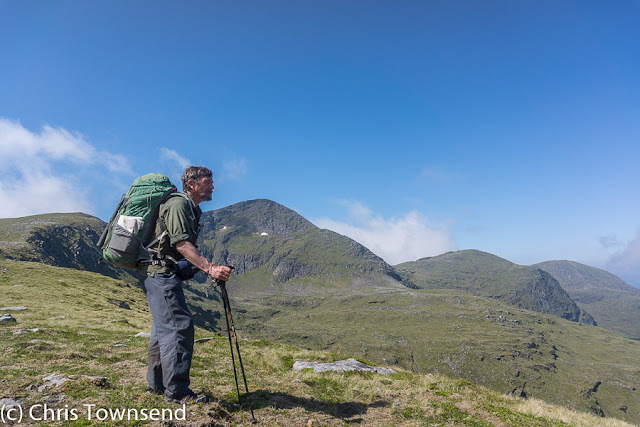 Climbing all the Munros and Tops in one walk meant far more ascent than on any previous long-distance walk so I wanted to keep my load as light as possible whilst still being comfortable and functional. I tried a few of the new lighter packs but wasn't convinced by any of them. Then Aarn Tate asked me to try some prototype Natural Balance lightweight packs. As I’d be able to change packs quite easily this being a walk at home rather than abroad I agreed and ended up using several models in the 65-75 litre range. When these packs were being shuttled around I used a 70 litre Lowe Alpine Alpamayo, which was fine, or an Arc’teryx Bora 60, which was very comfortable but unstable when scrambling as I discovered on the Aonach Eagach. This was the only walk I intentionally planned on using several packs though as I’ve shown above having one pack last a whole walk was rare. 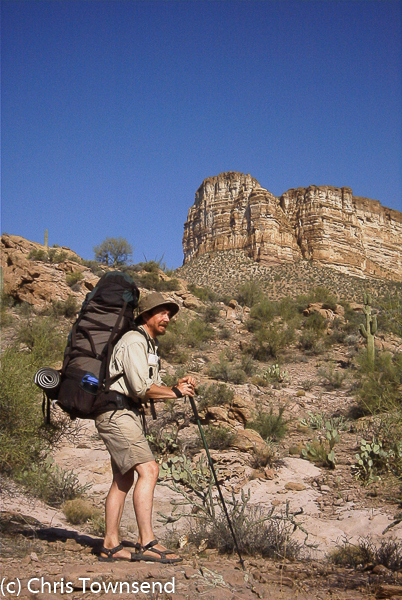 Whilst the Aarn packs were good with medium loads I needed one that would handle much more for the Arizona Trail, which I walked in 2000, as I knew I’d be carrying large quantities of water at times. Still not convinced by lightweight packs I returned to Gregory and the 82 litre Shasta, which survived the walk and carried the weight well. 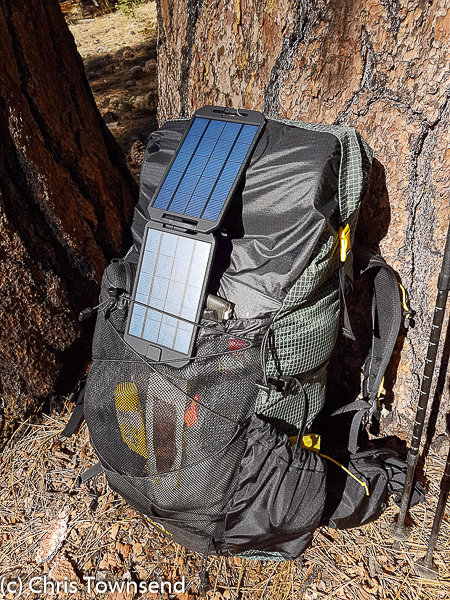 During the first decade of this century the development of lightweight packs moved fast and soon there was quite a choice of models that would handle quite heavy loads. Having used one of the lightest ones, the GoLite Pinnacle, on several two-week TGO Challenge crossings of the Scottish Highlands I decided on one of these for the Pacific Northwest Trail, which I walked in 2010. The 72 litre Pinnacle had no frame, just a lightly padded back, and a fairly minimalist hipbelt. However the curved shape meant it was surprisingly comfortable. The PNT was too much for it though. After three weeks the shoulder straps began to deform and feel uncomfortable. Holes started to appear in the fabric too. GoLite replaced it with the heavier though still lightweight Quest which had a frame and which was excellent for the rest of the walk. I reckon the Pinnacle was probably a rogue model that had slipped through quality control. Whatever the reason for the failure I decided that my experiment with frameless packs for long walks was over. 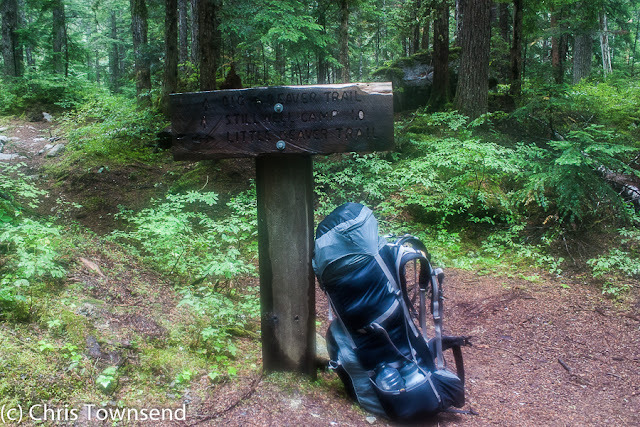 The comfort of the Quest, which was still far lighter than the packs I’d been using not many years before, was a key factor in this. I decided that internal frame packs around the 1 to 1.5 kg were ideal and that's what I've used since. 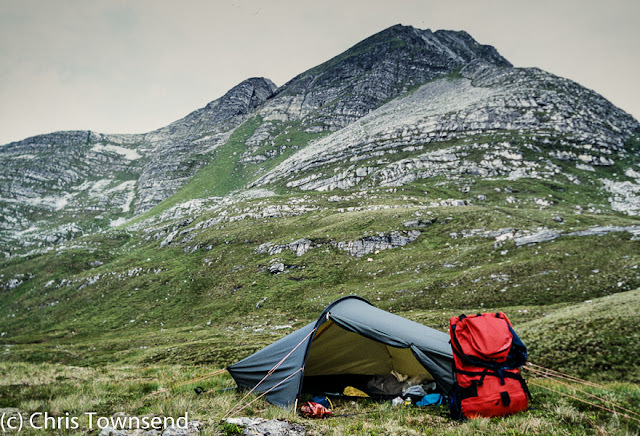 In 2013 I chose the internal frame 60 litre Lightwave Ultrahike for the Scottish Watershed, partly because it was far more water-resistant than most packs and I thought the walk could be quite wet, as indeed it was. The Ultrahike was excellent but the shape wasn’t right for my next walk. In 2016 I walked from Yosemite Valley to Death Valley with an internal frame ULA Catalyst pack because I could fit a bear-resistant canister in the top, which I couldn’t do in the Ultrahike. I carried heavier loads than recommended in this pack – I had eleven litres of water at one point in the desert – and it was fine. This summer I’m planning on another long walk – not a huge one but at least a month. Currently the Catalyst is the pack I’m most likely to use. The ULA Catalyst is the most comfortable carry of all my packs. It's also the most porous but comfort is the key. Really interesting to read about your experience with different backpacks over the years! I especially love the portraits of you over the years.